If you own a dog, you should own a long line. This is true especially if your dog is a young puppy just learning how to walk off leash and come when called. Short leashes tempt people to drag their dogs around. Not only does this teach the dog that a tight leash is normal, but the dog doesn’t learn anything. Even worse, a tight leash can cause behavior problems, especially when encountering other dogs. And why use a short leash when you could use a long leash? We believe in respecting leash laws, but thankfully leash laws don’t specify how long your leash has to be! Since at Wag The Dog, we train dogs to be street-wise, why not end the fight with the four foot line and enjoy a pleasant walk down the street which at least feels like it is off-leash? A long line is a long (preferably lightweight) leash. It doesn’t have to be expensive. In fact, since they tend to become filthy and knotted very quickly, you want to lay in a supply of clean, cheap ones and change them regularly. It is NOT those extendible leashes that come in a plastic housing. Those are from the devil: not only do they reward your dog for pulling, but if you drop the plastic handle, the rattling thing trailing behind your dog can spook him into a run so fast you many never catch up to him. What Do You Do With A Long Line? If you want to be able to have your dog follow you nicely on trails, return when called while playing off leash, or simply sniff through the bushes without dragging you through them too, YOU NEED A LONG LINE. One of the nice things about letting your dog drag a long line is that you can stop your dog simply by getting within 20 feet of her. Just step on the leash and BAM! She is stopped in her tracks. So, if you call your dog, and he doesn’t come, just step on the end of the leash, stop your dog in his tracks, and then reel him in. Your dog will learn that she doesn’t have an option when she hears you call her, and that is one of the secrets to a rock-solid recall. Don’t forget to praise and treat your dog when he gets to you, because coming when called is ALWAYS good, even if it is forced. For more on recalls, read our article on calling your dog. Want to be able to control your dog with voice alone? Do it hands-free as much as you can. 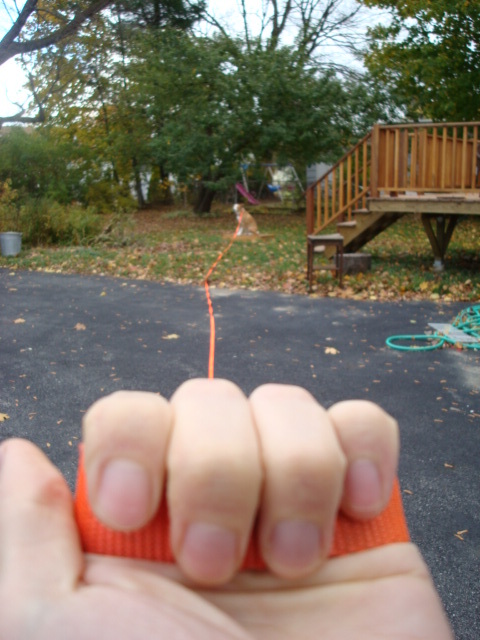 If you are constantly pulling and dragging your dog, she won’t learn much of anything. Instead, let her drag a long line. Say “stop!” and step on the line, stopping her in her tracks. Tell her what a good dog she is. Then say “go!” and lift your foot. Soon your dog will stop when you say stop, because she will think you can stop her with your crazy mind powers. If you want your dog to heel off-leash outdoors, first start by dropping the leash. If your dog tries to take off or run ahead, all you have to do is step on the leash, thus convincing your dog that he must heel even when you aren’t actively holding a leash. If you want your dog to be obedient at a distance, you need to work on it. A long line gives you quick access to your dog if things go wrong, while allowing you the space to work your dog from fifteen or twenty feet away. So, if you don’t already own a long line, go out and get one! You can find them in many pet stores and even some dollar stores, or you can ask your Wag The Dog trainer if she has one on hand – we usually have one or two lying around! Previous Common Mistakes Dog Owners Make: Not Watching The Puppy!